KURT LANGMANN PHOTO Alana O’Connor behind the counter of her cosy Book & Bean shop in Aldergrove. Alana O’Connor has found her comfortable niche in life with her Book & Bean shop. 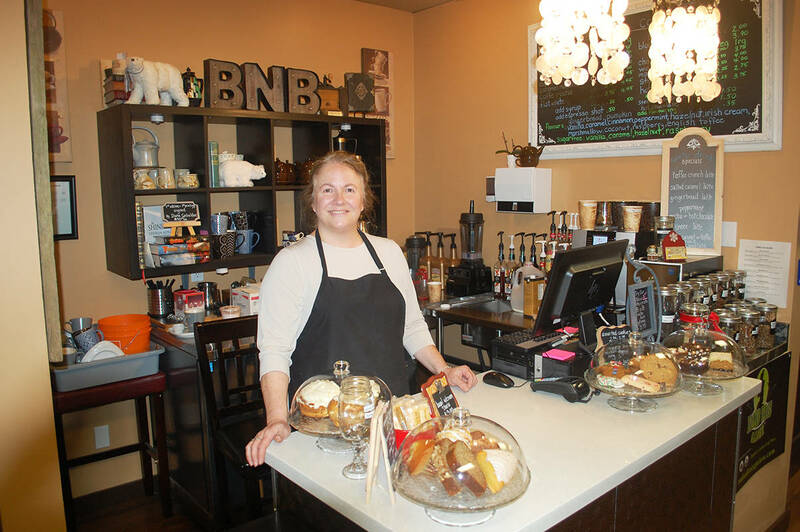 After 15 months in business on Aldergrove’s downtown commercial strip, the cosy little used books and fresh-made coffee shop has gained a loyal clientele of readers and coffee lovers. “We’ve been well-received,” said O’Connor. This pace of life also suits O’Connor, who after many years of working in the corporate world with its “insane, long hours” and travel demands, can now walk to work from her family’s home in Aldergrove. “It’s nice to be close to home,” said O’Connor, who works about 40 hours a week in the shop, while her long-time friend Micky Priest works the other 35 hours that the shop is open. The shop now has over 10,000 book titles in stock, in all genres, and all are brought in by customers who trade in their books for credits for new books. An avid reader herself, O’Connor says it’s “heart-warming” to see that many people, and not all of them older people, prefer reading books to poring over electronic or digital devices. The shop has hosted two book signings, with Nova Bannatyne-Eng (which raised $300 for the Cerebral Palsy Association of B.C. ), and Marty Allen, who writes the “Corporal James Vaanes” series of murder mysteries. And every second Friday evening from 6 to 9 p.m. the shop has an open mic night with Aldergrove performer Patricia Dunphy as host. The next open mic nights are Dec. 15 and 28. She also supports the “buy local” philosophy, and sources her drinks and baked goods from local suppliers, such as Pacific Coffee Roasters from Chilliwack and Monte Cristo bakery in Delta. It’s a combination that has proved successful, so much so that the shop is donating all of its tips to the Food Bank. “We have a $1,000 collected in tips from the past few months that we will be donating to the Food Bank just in time for Christmas, and we have started collecting tips for our next donation,” said O’Connor.